We are proud to introduce our new line of several in situ hybridization (ISH) and immunohistochemistry (IHC) reagents and their complementary blocker/diluents. These products are offered as higher sensitivity and lower background improvements upon our existing product lines: POLYVIEW® PLUS Detection Reagents, for antibody-based detection; and SAVIEW® PLUS Detection Reagents, for streptavidin-based detection. POLYVIEW® PLUS HRP (anti-rabbit) Reagent and POLYVIEW® PLUS HRP (anti-mouse) Reagent are two high-sensitivity, low background nanopolymer detection reagents for use with HIGHDEF® chromogens in ISH and IHC applications. These products have been developed by directly labeling anti-rabbit/anti-mouse immunoglobulins with a nanopolymer of horseradish peroxidase (HRP) using our proprietary technology. POLYVIEW® PLUS AP (anti-rabbit) Reagent is a high-sensitivity, low background nanopolymer detection reagent for use with HIGHDEF® chromogens in ISH and IHC applications. This has been developed by directly labeling anti-rabbit immunoglobulins with a nanopolymer of alkaline phosphatase (AP) using our proprietary technology. In addition, we offer an antibody blocker/diluent for use with all our POLYVIEW® PLUS Detection Reagents. SAVIEW® PLUS HRP Reagent is a high-sensitivity, low background streptavidin-based nanopolymer detection reagent for use with Enzo’s HIGHDEF® chromogens in ISH or IHC applications. SAVIEW® PLUS was developed by labeling streptavidin molecules with a nanopolymer of horseradish peroxidase, using our proprietary labeling technology. We offer this product with an accessory, the streptavidin blocker/diluent, a ready-to-use blocking buffer and diluent for use with our SAVIEW® PLUS Detection Reagent. 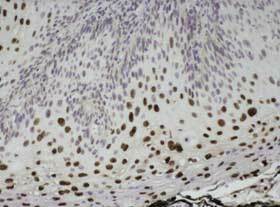 Like many other Enzo Life Sciences’ immunohistochemistry products, these IHC detection reagents are supplied in a ready-to-use format. Enzo Life Sciences is a leader in immunohistochemistry, with products ranging from antigen retrieval to visualization, backed with over 40 years of research and manufacturing experience. For more information on, or to order, the products mentioned here or other Enzo Life Sciences products, please visit us at www.enzolifesciences.com or call us at 1-800-942-0430.